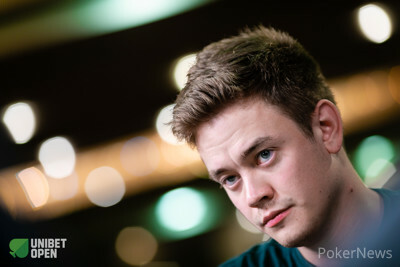 Andrey Yanyuk was left with a miracle and his cards, king queen suited, were already in the muck while he paid off the 68,600 of Peter Curry. The latter had flopped a set and turned a full house on the :::Js:::5h:::4h:::Jh:::7h board. Yanyuk ended up all in with :::Kc:::Qc soon after and turned top two pair, but :::Ah:::5d rivered the wheel. Ian Simpson has taken over the lead and also had Linda Nguyen at risk for around 9,000 with :::As:::3c versus :::Ac:::2h, and they chopped it up.